Running 102 miles just over two months ago, I had firmly decided to take a mandatory 102-day break, one day per mile covered, to safely and properly recover. Perhaps because I fulfilled a dream that took up much of my life for a couple of years, I felt a few days following an immense void in my life, which invited back longer and more powerfully than ever before many disturbing intrusive thoughts, one symptom of my obsessive-compulsive disorder. An innate suburbanite extrovert, I have been constantly forced to fight loneliness of a minute city of 33,000, exacerbated by the not-so-healthy work environment. “Maybe running has been working as my therapy and I just didn’t know it,” thought I, triggering me to jump back into running only a month after the ultramarathon in Texas. 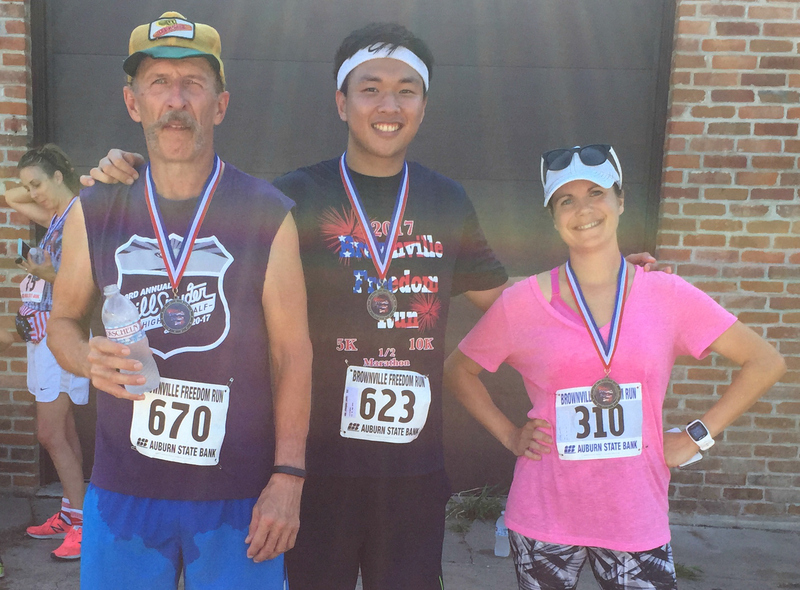 The resumption of habitual running brought back my desire to race, and I spontaneously registered for a half marathon at the 2017 Brownville Freedom Run, hosted in the historic Brownville, Nebraska, to celebrate the Fourth of July. I love talking to people in races! Happy Fourth! I hoped to embrace again the feeling of running with dedicated, disciplined, and humble strangers and befriend some of them. I simply wanted to have fun and did not care too much about my performance or finish time, as I understood my body still needs time to fully recover. Furthermore, I began experiencing stomach pain a week and diarrhea for two days prior to the event (because I unknowingly drank a brutal amount of laxative tea for days). I relied on prayers and medication and made sure to consume much of sports drinks to replenish electrolytes and water. The hours of fireworks outside my motel in Rock Port, Missouri, allowed me only two hours of sleep, but I trusted my body that could move without sleep for nearly 40 hours in my most recent race could manage 13.1 miles. Indeed and thankfully, I held up without any issues, although blistering heat and nearly 100% humidity did affect me both physically and mentally—along with most other participants—the final 3 miles of the concrete-gravel course. I do not recall sweating nearly as profusely as I did in any of my previous 23 races. All of these obstacles considered, I am semi-content with my 2:05:40. After all, I traveled 3.5 hours, the farthest I have driven for a half marathon, to merely have fun and feel free, which I did.